UW-Stout is one of few polytechnic universities in the country to offer such a range of specialized programs. Students from across the country flock to Menomonie to learn about these fields and to put their skills to the test. From clothing and apparel design to environmental science, here are a few of the standout programs offered at UW-Stout. How many universities in the Midwest offer a degree focused on following the trends and future of the fashion and textile industry? Courses in garment construction, pattern development, sketching, design, production processes, and manufacturing technologies just scratch the surface of what students in this program learn. Faculty members lead hands-on courses that build the skills students need for the creation, manufacturing, and marketing of their designs. The Apparel Design and Development major is a bachelor of science degree that is easily paired with a host of minors or specializations such as Sustainable Design or Web Technology, which prepare students for real-world application of all they learned in school. UW-Stout puts on a yearly fashion show titled Fashion Without Fabric, in which the Apparel Design and Development students create avant-garde or fully functional pieces made entirely from anything and everything except fabric. UW-Stout’s bachelor of fine arts in Entertainment Design pushes the boundaries of what is possible. With classes in cinematography, animation, comic art, and so much more, this program bridges the gap between art and technology seamlessly. Students develop a foundation of art and design courses, including two- and three-dimensional drawing and imaging, then move on to specialize in animation, comics and sequential art, or digital cinema concentrations. Students in this program have access to the award-winning School of Art and Design Facilities, including fine art studios, design studios, computer laboratories, a process laboratory, and a print laboratory. Student work is showcased in two different galleries on campus and in off-campus exhibitions. This program is closely linked to UW-Stout’s bachelor of fine arts in Graphic Design and Interactive Media. UW-Stout’s bachelor of fine arts in Game Design and Development prepares students to take on the video game market from all angles. Students in this program learn what it takes to become game artists with the skill to make headway in the largest entertainment and video game corporations in the country. 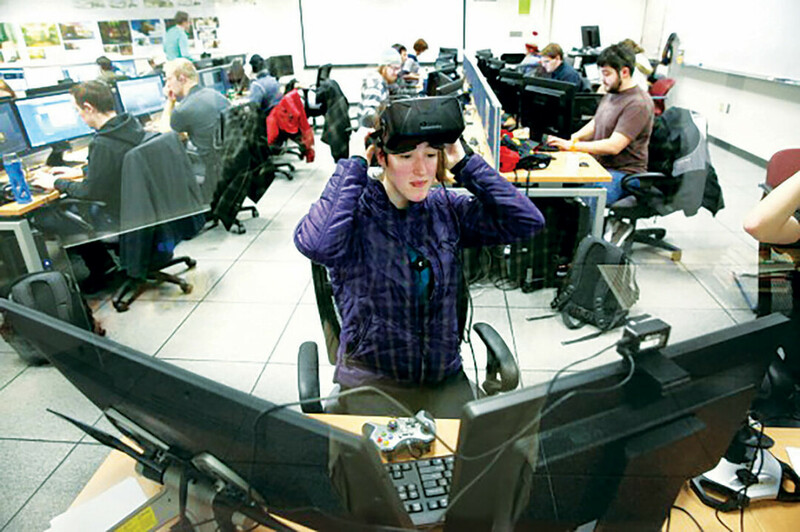 UW-Stout offers opportunities for Game Design and Development students to collaborate with students in the computer science track, and three laboratories outfitted with high-end hardware and software. Courses are offered in Pixel and Vector Art, Board Game Production and Processes, Interactive Media Design, and even a History of Interactive Media. The Game Design and Development program at UW-Stout offers students the opportunity to take their passions and create a career that will challenge and inspire them. UW-Stout’s bachelor of fine arts in Industrial Design is a unique program that mixes engineering and art to provide students with the mechanical acuity to create something innovative. Students in this program have opportunities to intern at regional, national, and international corporations that offer real-world applications for what they have learned in the classroom. Classes offered to students on the Industrial Design track include Engineering Graphics Surface Modeling and Rendering, Ergonomics, Graphic Design, Printmaking, History of Design, Aesthetics, and so much more. Industrial Design students have access to the School of Art and Design Facilities as well as opportunities to have their work displayed in on-campus galleries and off-campus exhibitions. This program focuses on the intersection of problem-solving and creative action. Students learn how to take the designs swirling around in their heads and apply that vision to real-world problems. UW-Stout’s bachelor of science in Environmental Science embraces the intersections between daily life, wide-scale human activity, and the environment to teach students how they can act as responsible consumers and producers in the world today. With concentrations in Aquatic Biology, Environmental Health, and Natural Resource Conservation, the students in this program learn skills in classroom and laboratory settings that apply to fieldwork and scientific research. Student-led organizations, individual and group projects, and faculty-led research build a foundation of skills that students can cash in on as soon as they graduate. With classes in botany, zoology, geography, ecology, technical report writing, and experimental design, the students in the Environmental Science program are prepared for any scientific field they wish to go into.